Now that we’re in our second week of 2017 and some of the shiny new feelings have worn off—it’s time to turn our resolutions into actions. My work-based resolution is to continue to grow into the best resource and guide for all Lodges throughout the grant application process. This has different meanings depending on which part of the grant cycle we’re in, but with fast approaching deadlines, right now that primarily means encouraging more Lodges to apply for a Beacon Grant! My first step toward reaching my resolution was to send out a postcard promoting the Beacon Grant to Lodges that have never received one. Can you believe there are still Lodges leaving grant money on the table? Are you one of those Lodges? 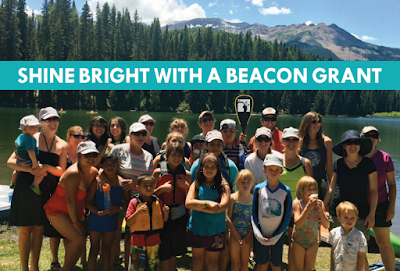 No worries—applying for a Beacon Grant is easy! But, hurry and apply today. The deadline to submit a Beacon Grant application is March 31, 2017! Be sure to check out our Beacon Grant Breakdown presentation. Whether it's your Lodge's first time applying or you just need a quick refresher, it's sure to put you on the fast track to receiving a Beacon Grant. Have you received a Beacon Grant before but are having trouble with this year’s application, need to adjust your project, or just want a new idea on how to serve community members in need? Check out our Beacon Grant webpage or contact me directly. I can be reached at jocelynm@elks.org or by phone at 773/755-4730. You’ll not only get the Beacon Grant guidance you’re looking for, but you’ll help me reach my resolution. Here’s to a happy 2017, and another record year for Beacon Grants!